The industry-leading private label bottled water supplier, Niagara Bottling LLC, with its many plants throughout the US and Mexico, has recently upgraded its Salt Lake City fa-cility with a Sidel complete PET line. The line features two Super Combis, equipped with the innovative and compact ground-level preform feeder, EasyFEED™, along with Gebo Cermex conveying and end-of-line equipment. This investment has enabled the ambitious bottler to significantly increase its productivity through high-speed, efficient manu-facturing and high availability rates of the line. Niagara Bottling LLC, with more than 50 years of business experience, has based its success in the water market on offering customers a high-quality product, which is safe and has a great taste profile. Grounded on the fact that the PET bottled water market in the US is expected to grow by a CAGR (compound annual growth rate) of 3% year on year between 2016 and 2020 , the company decided to rely on its long-standing business relationship with Sidel and install a new complete PET line to enlarge its production capacity to answer consumers’ demand. This choice is proving key to deliver higher performance and safety, while increasing cost efficiency. Starting point of the new complete line at Niagara’s plant is Sidel’s EasyFEED, an innovative, compact and safe ground-level preform feeder for PET lines. From the hopper, the preforms are lifted by an elevator column to only 2.5 metres. They are then sorted and vertically driven into the bowl of a rotary unscrambler. Positioned at the edge of a rotating table and supported by the neck flange, the preforms are moved onto a rail by a filtered airflow. Instead of traditional gravimetric infeed rails, the preforms are driven by two motorised, food-grade brush belts up to the infeed blowing wheel, contributing to keep the level of preform integrity very high. This patented technology ensures operators’ safety and overall easier operations by significantly reducing the footprint and the height for preform infeed. 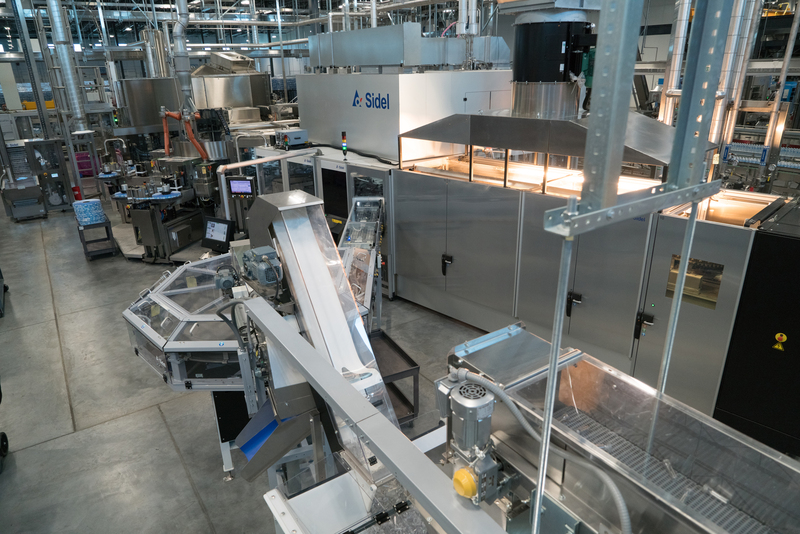 With output speeds up to 82,000 bottles per hour, Sidel EasyFEED is optimal for PET water bottle producers like Niagara Bottling LLC, who need to combine very high-speed production lines with ultra-light PET bottles handling, while increasing the availability of their lines. “We have seen large gains with the two EasyFEED solutions. In terms of machine availability, they are running above 98%, with a mean time between failures (MTBF) that is more than three hours: this is a big improvement to anything we have seen in the past. In addition, in terms of preform integrity, the handling via EasyFEED is extremely efficient and provides good quality preforms to the blow moulder. Its very high level of availability requires minor interventions from operators. And – when needed – its ground-level design provides maximum safety. All in all, we have gotten better performance from the new preform feeders,” adds Paul Wilson, Vice President of Manufacturing at Niagara Bottling LLC. While the successful journey of the PET bottle starts with the right preform feeder, the Super Combi is crucial in reducing total costs of ownership (TCO) for the customer and maintaining a very high level of efficiency. The team at Niagara Bottling LLC recognises that its tighter layout, a better utilisation of the integrated labeller and the redesign of the labeller itself are extremely beneficial for their production targets. Namely, the labelling technology provided by Sidel is quite exciting for the bottled water producer. “Talking about availability, the labeller has shown impressive results: it offers great ease of operations, together with efficient and top-quality label application, ensuring high-level performances,” explains Paul further. Niagara is one of the first companies running the brand-new Roll-Fed labeller, which can handle lightweight containers and ultra-thin labels, yet allowing for better glue control and distribution, together with reduced consumption. While developing this labelling solution, which uses hot glue to apply wrap-around plastic labels, ease of operations has been high on the Sidel engineers’ agenda. The vacuum drum is built in light-weight sectors for easy and quick replacement and features newly patented adjustable pads for longer production time and minimal maintenance time. The ergonomics of the solution have been significantly optimised for top productivity and a sustainable footprint, with all main components fully visible and accessible during production or maintenance, without having to disengage the station. For the leading producer of bottled water, which covers more than 40 different brands, the re-duction of TCO was the key when they invested in the new piece of equipment. With EasyFEED as the safe and easy-to-operate entry point to the line and Super Combis showing their performance in blowing, filling, labelling, and capping, the end-of-line production needed to be optimised for footprint, efficiency at very high speeds, and overall lower capital expenditure. This is where engineers at Gebo Cermex, part of the Sidel Group, stepped in. The Gebo Cermex high speed shrink-wrapping system, which is part of the end-of-line at Niagara, delivers high quality packs, and the fully accessible low level palletiser with robotic layer preparation at the infeed always ensure reliable, non-stop production. With these features, the solutions hold performance extremely high, providing the entire line – from start to finish – with unmatched efficiency and flexibility.